As we discussed last week, there’s no one-size-fits-all definition of the younger generation entering the workforce. While it’s tempting to use the catchall phrase “Millennials” you should be aware of an even younger and tech savvier cohort coming up the ranks. Meet Gen Z–the 70 million young Americans born after 1995—i.e. your teenage and young adult kids and grandkids who don’t even remember a time before social media. Like it or not, you’re going to be working with both Millennials and Gen Z for the foreseeable future. You’re going to be recruiting them, marketing to them, wooing them as clients, transferring your assets to this group and possibly even working for them. You might even find yourself negotiating with their Helicopter Parentsduring the interview and hiring process. 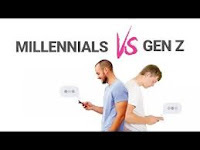 If nothing else, it’s important to understand the key differences between Millennials and Generation Z because they certainly don’t think alike. Just so we’re clear, a “Millennial” is a person reaching young adulthood around the year 2000. Gen Z’ers are college students, high school students, middle schoolers and below. 1. Gen Z is Less Focused. Today the word relevant is constantly being refined and Gen Z lives in a world of continuous updates. According to Beall, Gen Z processes information faster than other generations thanks to apps like Snapchat and Vine. Thus their attention spans might be even shorter than Millennials’. Our take: You don’t have to text and tweet to reach them, but keep your messaging short and get right to the point. On the off chance they want more info, they’ll reach back out. 2. Better Multi-Taskers. Gen Z has the stereotype of being less focused than their Millennial counterparts. They will create a document on their school computer, do research on their phone or tablet, while taking notes on a notepad, then finish in front of the TV with a laptop, while face-timing a friend. My take: As the father of a 13 year-old and 18 year-old, I can assure you this is NOT an exaggeration by Beall. But, if the work is good, who cares who, when or where they get it done. 3. Bargains. Beall said Millennials care more about prices than Gen Z. This is arguably because they came of age during the recession. From personal experience I would say Gen Z is a bit on the materialistic said as they are very brand conscious and know the prices of luxury cars and clothes, as well as the prices of homes in their neighborhoods, how much they’re teachers are paid and whether or not they’re in a “rich” or “hood” school district. 4. Gen Z is Full of Early Starters. Beall said many employers are predicting that more teens, between the ages of 16 and 18 will go straight into the workforce, opting out of the traditional route of higher education, and instead finishing school online, if at all. Our prediction is that there will be a renewed interest in the skilled trades—electrical, plumbing, HVAC, auto repair—especially by boys. There will also be more gap years and delayed entrance to college….not necessarily to travel (unless to be digital nomads), but to earn money working or to try their hand at a startup when the personal risks are very low at that age. When they do decide to attend college, we also think there will be more use of income-share agreements instead of student loans to finance there ever-rising cost of tuition. In our next post, we’ll look at four more ways that Gen Z differs from Millennials and what you can do to get along with them, leverage their talents and not get in their way. If you’re smart, you’ll try to adapt and understand them. But if you roll your eyes and try to impose your will on Gen Z, you’ll find yourself taking a very long walk off a very short pier.